I’ve been using my iPhone 3G for a few months now. Along the way I’ve discovered a few “less-than-obvious” tricks and shortcuts that save me a fair bit of time, and I thought I’d share them. While most of these are in the iPhone User Guide if you dig around, I’d say they’re useful enough to deserve a mention in their own right. Say, like me, you’ve gone a bit wild on the App Store and currently have a large number of apps installed. I have 101 apps, which means 7 Home screens to flick through. Your most important apps are on the first screen, right? Say you’re currently on screen 7, and want to get to the first screen. Simply click the Home button to jump there. Nice! You can also tap the iPod button in the window to go straight to the iPod. Choosing Home means that double-clicking has the same effect as single-clicking: it merely takes you to your Home screen. Phone Favorites – the default setting – brings up your favourite contacts for quick dialling. However, if you choose iPod then double-clicking takes you straight to the iPod app, regardless of whether a track is playing. You can also use the iPod Controls setting to turn off the feature that displays iPod controls when a track is playing. When you finish typing a sentence, you usually want to type a period, followed by a space. This is a bit awkward as you have to tap the bottom-left Number key, followed by a period, followed by the space bar. There’s a much quicker way: just double-tap the space bar. The usual way to enter digits or symbols is to tap the Number key, then tap the digits or symbols, then tap the Number key (which now shows ABC) again to return to the regular keyboard. However, if you only want to type a single digit or symbol then there’s a quicker way. Tap and hold the Number key to bring up the number/symbol keyboard, then drag your finger to the digit or symbol you want to type, and let go. This types the digit or symbol and immediately returns you to ABC mode. The iPhone’s keyboard has a Caps Lock mode for typing all-caps words (acronyms and so on), though it’s disabled by default. To turn it on, go to Settings > General > Keyboard, and flick the Enable Caps Lock switch to ON. Now, when using the keyboard, quickly double-tap the Shift key to enable Caps Lock (the Shift key turns blue). Type your capital letters, then tap the Shift key again to turn off Caps Lock. With the Mac OS X Mail app, it’s easy to save your currently-edited message as a draft by clicking the Save as Draft button in the toolbar. This works for most screens that involve scrolling. 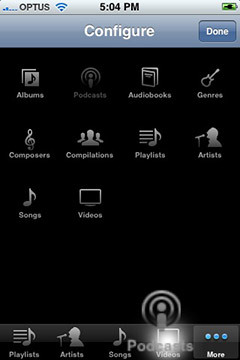 iPhone ships with 5 icons in the iPod’s dock – Playlists, Artists, Songs, Videos and More – for quick access. However, let’s say you hardly ever watch videos on your iPhone, but you do listen to a lot of podcasts. 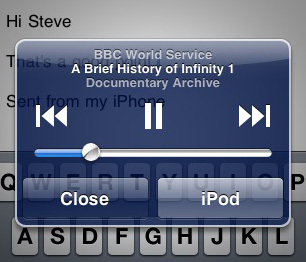 iPhone lets you change the default dock icons, replacing the Videos icon with a Podcasts icon. Pinching to zoom in and out in the Maps app is pretty neat, but can be a bit fiddly if you’re, say, walking along holding your iPhone. You probably know that you can double-tap to zoom in quickly, but how to zoom out quickly? Easy: tap with 2 fingers! Tap the button to save the image in your Photos library, in the Camera Roll album. Many web pages contain frames that you can scroll through to view all their content, but Mobile Safari doesn’t give you scrollbars for frames. No problem: Just tap and drag with two fingers inside a frame to scroll the frame. Finally, ever wondered how all these iPhone screenshots are taken? Simply press the Sleep/Wake button (the button on the top right of the iPhone) and the Home button at the same time, then release. The screen flashes, and your screen shot is stored in your Photos library in the Camera Roll album. 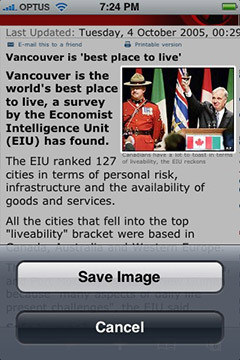 This entry was posted on Monday, January 5th, 2009 at 7:40 pm	and is filed under iPhone. You can follow any responses to this entry through the RSS 2.0 feed. Both comments and pings are currently closed. This is a great collection of tips, thank you for posting them! What a great set of tips! 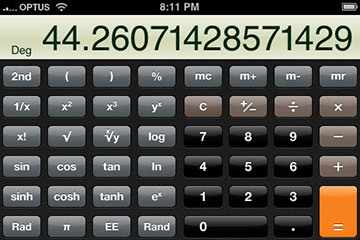 The calculator, two-finger zoom out, and various save images tips are particularly useful. These are GREAT. I stumbled onto about half of them on my own, but would never have found the texting ones (all caps, effortless shifting to/from symbols and numbers. THANK YOU. Can’t think of any addtional ones myself, look forward to those from other iPhone aficionados. ahhh, the double click of the Home button is the greatest tip ever. THANKS! Thanks for the tips really..
2, 5, 7, 10, 11 and 14 are first time to know actually..
and 6 was a real greate reminder..
@clayton: Good tip, thanks for posting it. @Stephen: That’s a nice trick, that one. I use it all the time! Here’s a trick for transferring notes onto your mac without Internet connection(on your mac or PC). As most of you all know there’s an option for transferring notes in iTunes that you can click on, but where does it go? It’s suppose to go to your “mail” app. But for people like me, with no Internet on my mac, but of course on my lovely iPhone, that option renders itself useless for transferring text. All you do is copy whatever text you want to transfer, open up your calendar and make a new event. Paste your text into the notes section, you can paste quite a lot of text I might add too. That easily transfers over to your mac or PC. I also want to add… I LOVE MY IPHONE 3G S! as of now with updates to mail, cut, copy & paste, a wonderful video camera and everything else, the iPhone is a PERFECTED device. I thank GOD for this device, it is completely reliable and can’t imagine life without it. And for the keyboard, that some blackberry owners use as an argument against the iPhone, well, typing on the iPhone is my FAVORITE thing to do on it. Seriously, it is so smooth and fast. I went into Best Buy and played with the Blackberrys and Palm Pre. All I got to say is “third rate” all the way, those keyboards felt soooo CLANKY and cheap. There’s a reason the iPhone is the # one seller, highest regarded and has given Apple the 3rd largest market share. The voters have voted, iPhone wins! @Leighton: I’m not a fan of hardware keyboards either. I have quite big fingers and find I can type better on the iPhone (especially now that the landscape keyboard works in nearly all apps). Nice work. Tip 7 was a good find, I would have not figured that out. I’m sure you have also discovered by now that the majority of the symbols offered have similar options once held down. A friend of mine said there’s a short-cut for taking a picture with the camera that is similar to the trick to doing screenshots, but I haven’t figured it out. (He could be making it up, or I misunderstood what he meant.) Anybody know? Seems like I often miss the moment trying to navigate to the camera app. Would be slick if there was a hold-this-and-that shortcut that would do that. @Fill: I’ve never heard of such a feature on the iPhone. Would be nice though! I have come across several of these by accident but it was interesting to find out how to do these things when you want rather than by accident. It took me ages to work out how I managed to take a screenshot and up until now I couldn’t figure out how to get caps lock on. how do i change a setting so that when i read text on a website i DO NOT HAVE TO SCROLL LEFT OR RIGHT i would only like to scroll down. @randy: I’m guessing you mean those iPhone-specific single-column layouts on some sites? This isn’t a setting within the iPhone, but rather a CSS setting on the website in question. So it depends on the website. If you’re browsing a regular website then double-tap the main content column to expand the column to fill the whole screen. @jess: This doesn’t work on iPhone 3G/3GS, only iPhone 4. Great tips. I must share two apps that i just bought — I’m not affiliated with the company. 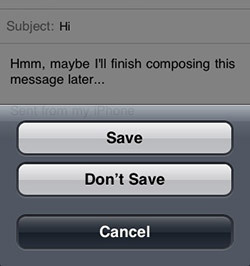 I have been searching for months for a way to pull my text messages off my iphone 3 to my Mac computer. Syphone worked briefly, then itunes changed their code (or something) and stopped working. I just paid a whopping $8 for Decipher TextMessage and Decipher VoiceMail and they work beautifully. Sooooo happy. @Matt, try again, @jess’ voice control suggestion works just fine on my 3GS. It’s amazingly good at finding one of my contacts but hit or miss when I ask to play a particular artist. can you make a group of contacts on the Iphone4 so you can a text to multiple people? @Ed: You can make a group in Address Book – it then syncs to the iPhone. Then in the Messages app, create a new message then tap the + symbol top right, then tap the Groups button top left. Great tips, thanks. I got 9 by trial and error but what i am looking for is to scroll down as well. Especially w my iPod playlists being soooo long. About the quick access to camera – this can be changed in settings so you can double-click the home button and the camera will come up. Hope you manage to access this. Is there any way to make a not equal to symbol ≠ on the iPhone? @Madeline: Not AFAIK (apart, of course, from copying & pasting the symbol from an existing document, email or webpage). My iPhone screen is locked in the portrait position. Not sure how I did it so I don’t know how to undo it. Any suggestions? @Cherij: Have you tried rebooting the phone? A quick double-click of the home button on my 3gs reveals the four most recently used apps across the bottom of screen. Sliding finger right gives ipod controls, sliding left reveals next four most recent apps, and the next, etc..
2. Press and hold switch on/off till shutdown screen appears. 4. Press and hold down Home button until it returns to the first page. Thats all, progamm is closed, you can reopen it if it hang. One camera trick is only available on iOS5: from the lock screen, double-tap the home button, then select the camera button just to the right of the lock slider. This will bring you right into the camera app even if your phone is normally locked. You’ll still have to unlock it before you can do anything else, but it can keep that perfect photo op from getting away. I find the background image on this page makes it almost impossible to read! Please change it! There’s also a folder tip for you. If you hold down the icon for an app until it starts to wiggle, you can then move it atop one of your other icons and the phone will automatically create a folder with both apps in it. This can be a great way of cleaning up your seven home screens. These folders will be given a default name that is appropriate for both of the apps you start with. Bu you can pick a different name if you want to. Love these great tip and tricks! Is there a way to move the letter scroll bar to the left such as in the contact list?